Lithemba is a level 2 BEE contributor that thrives on projects specific to the South African market. We deliver efficient and economical solutions, from initial design and concept to production and prompt delivery countrywide. Lithemba is also a large-scale print manufacturer and supplier to SADAC countries such as Mozambique, Namibia, Botswana, Zimbabwe and Zambia. 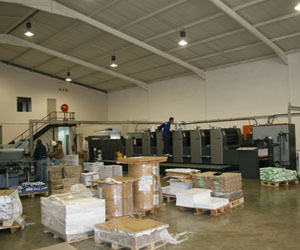 With a network of logistic partners we deliver large-scale printing solutions to a variety of markets across Africa. An experienced account executive will advise you on colour consistency, media and paper stock selection, proofing and detailed finishing – ensuring that the final product matches up to your expectations. Colour management is core to our service offering – we understand that your corporate identity needs consistent colour representation. Pantone charts are used to manage process (CMYK) colours, as well as printing with custom Pantone spot colour inks. Full colour proofs are always supplied with a 95% colour accuracy to ensure you know what you are getting as the final product. Mock-ups on your paper selection can also be supplied. Packaging mockups can be created before final production. Our pricing is highly competitive and we will match any quote supplied with full specification. Our exceptional customer service and turn-around-times make us your perfect long-term partner in printing. Contact us to chat to an experienced sales representative. Lithemba is a Level 2 BEE contributor click here to view our BEE certificate. Copyright 2018 | Lithemba Holdings | All rights reserved. At Lithemba Holdings we offer high quality printing to our clients locally and internationally.